You should already have received your rollout container, recycling bin, and informational brochures. Four trucks will come by each week to collect rollout garbage, recycling, yard waste, and bulky items. You will need to call to schedule bulky item pickup. For more information, visit the Solid Waste "Welcome to the Neighborhood" web page or call Solid Waste Customer Services at 704-336-2673. Programs offered through Charlotte Department of Transportation (CDOT) offer neighborhoods perhaps their greatest opportunity to impact the community. For more information on any of the items described below, visit the Charlotte Department of Transportation web site or call 704-336-3893. Before pursuing any CDOT services, you must first determine if your streets are now maintained by the city. If not part of the city system, not only will CDOT not maintain the streets, but also Solid Waste and and other departments may not provide services along them. All public roads in unincorporated areas in North Carolina are maintained by the North Carolina DOT. Developers of residential subdivisions must build streets to meet state and local codes. For streets in unincorporated areas, developers generally apply to NC DOT to have the state take over maintenance. When annexation occurs, the NC DOT turns over most streets to the city. Exceptions are numbered highways and certain other major thoroughfares. However, developers do not always turn over the streets to the state. Be sure to call CDOT to find out if your streets are now maintained by the city. If not, CDOT staff must review engineering plans to ensure compliance with code before accepting maintenance. If you live on a private, unimproved road, it might not meet code and be accepted by the city. Be sure to contact CDOT to find out what improvements will be needed. CDOT not only maintains the streets but also street signs and sidewalks. If a street name sign, stop sign, or other sign is missing or damaged, call CDOT to request replacement or repairs. Contact CDOT about installation of street lights and traffic calming devices, such as 25 mph speed limits, speed humps, and multi-way stop signs. These generally require support from the community through petition signatures. Visit the Charlotte Department of Transportation web site to review these and other services available. Be sure to take advantage of any that you believe will benefit your community. Neighborhood Development provides a range of public services designed to help maintain and improve the quality of life in Charlotte's neighborhoods. Among these are code enforcement and Neighborhood Matching Grants. For more information, see below or visit the Neighborhood Development web site. Are there areas in your neighborhood that are not maintaining their property in a safe, clean manner that is consistent with city code? Has graffiti appeared on street signs, walls, or other neighborhood structures? If so, you may report these to City/County Customer Service Center at 704-336-7600. Inspectors will review the problem and work with property owners to correct it. For more information, visit the Code Enforcement web site. The Neighborhood Matching Grants Program, administered by the Neighborhood Services staff, awards funds to neighborhood-based organizations, including homeowners associations, for projects that will make neighborhoods better places to live, work, play and shop. For the last application cycle in March, areas with a median household income of no more than $75,267 were eligible. 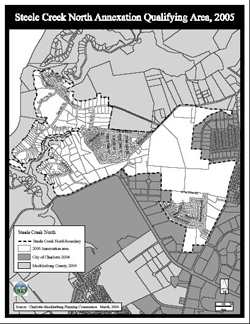 Several Steele Creek areas met this requirement, including the Crossings and neighborhoods along Sandy Porter Road and Brown-Grier Road. This program provides a great opportunity for neighborhoods to obtain funds for community improvement projects, especially for newer homeowner associations that have not yet built up funds. One area neighborhood that was annexed in 2001 applied for and received a grant for over $9,000 to help pay for street lights. For more information on the program, including eligibility and the schedule for the next grants cycle, contact the Neighborhood Matching Grants staff at 704-336-2349 or visit the Neighborhood Matching Grants web page. Neighborhood Services staff also provide training for neighborhood leaders and other services. See more at the Neighborhood Services web site. Charlotte's cooperative tree replacement program offers neighborhoods the opportunity to partner with the City to remove and replace dead or diseased trees in Charlotte neighborhoods. It is administered through the office of the Charlotte City Arborist in the City Engineering Department. Neighborhoods also may arrange to have trees planted in public right-of-ways adjacent to common areas or private lots for a nominal fee. For more information, contact Craig Monroe at 704-336-5753. Charlotte-Mecklenburg Utilities Department (CMUD), a City department, already provides water and sewer services throughout many areas of Mecklenburg County and uses the same rates and service policies for both City and non-City customers. If water and sewer services aren't yet available in annexation areas, the City will install water and/or sewer lines within two years of the date the annexation becomes effective. For more information or to find contact information, visit the CMUD Customer Service web page. The Charlotte Fire Department has constructed Temporary Station 37 on Sledge Road near Shopton Road West. This station has one engine company and will have a minimum of four persons on duty at all times. Along with existing Station 26 located on S Tryon Street north of Westinghouse Boulevard, this temporary station will serve the newly annexed areas until two new permanent stations are built. One station will be located on Shopton Road West west of Withers Cove at Limehurst Place. This site was donated by Crescent Properties, developers of The Sanctuary. It has access to Lake Wylie and eventually will house boats for use in water rescue. This station should be open in 2007. The second station will be built on Highway 49 just north of Shopton Road West and should be open in 2008. See an excerpt for the Annexation Public Meeting on September 9, 2004 for additional details. 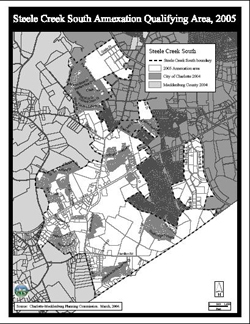 The Charlotte-Mecklenburg Police Department will continue to service both incorporated and unincorporated areas in Steele Creek. For more information contact the Steele Creek Division at 704-336-8671 or see the Steele Creek Division web page. Please visit the Charlotte-Mecklenburg web site at www.charmeck.org to find out more about Charlotte departments and the services they offer. The city provides certain services automatically, but for others, you have to ask. Whether as individuals or homeowner associations, it will be to your benefit to ask and take advantage of them.